This is in response to a tag initiated by super mom, Earth. In the photos above are the two women I am giving tribute on this very special day. Without them, I wouldn't be here and I wouldn't have the sweet life I am having now. The photograph on the left is of my mom and the other one is a snapshot of my mother-in-law. Both are super moms in their own right. Both made ends meet to be able to provide a good life for their children. For that, I am forever grateful. 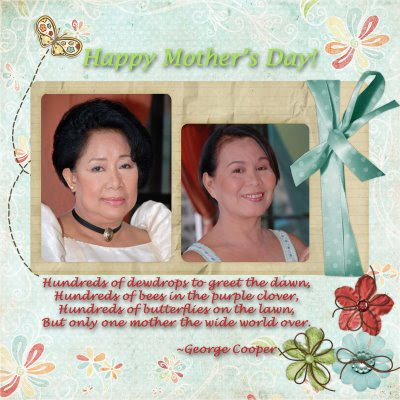 I am also extending my warmest greetings to the other super moms out there. Motherhood is the hardest but most fulfilling job. Most Dads work from sun up to sun down but a Mom's work is never done. For that, we are compensated well because we are paid with hugs and kisses! Agree? I hope you are! I am tagging these super moms: MommyBa, iMom, and Joey. These tag is open to other moms as well. Just create your own scrapbook post it on your blog, pass this Mother's Day tribute/greetings/tag to all the moms you know and link back to the one who tagged you.